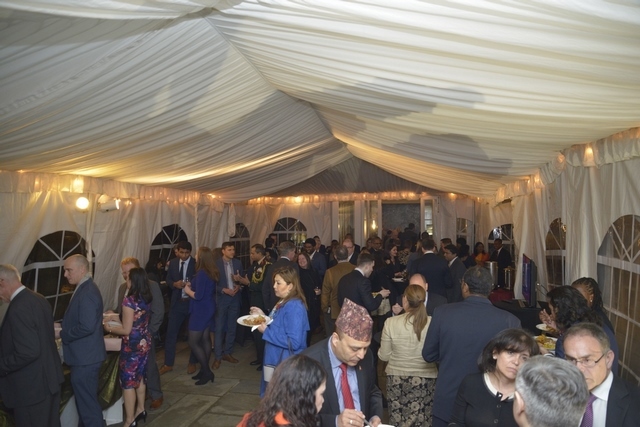 Delivering his speech to a packed audience of guests at the celebrations of Sri Lanka’s 71st Anniversary of Independence at the Embassy Chancery on 04th evening, Chargé Sarath Dissanayake said that the presence of a large gathering of senior US officials including Principal Deputy Assistant Secretary of State for South and Central Asian Affairs, Ambassador Alice Wells, Chief of Protocol, Ambassador Sean Lawler, Deputy Assistant Secretary of Defence for Policy, Dr Joseph Felter among others, is a manifestation of the close friendship and relations between Sri Lanka and the US. The Chargé d’ Affaires underlined the emphasis placed and far reaching progress made by successive Sri Lankan governments to usher in an era of peace, progress and development encompassing all sections of the society while promoting ethnic reconciliation, political and constitutional reforms, and fundamental freedoms for all. On the bilateral front, Chargé d’ Affaires expressed his country’s satisfaction over the upward trajectory of relations and mutually beneficial cooperation prevailing between the two countries based on common values and mutual respect. 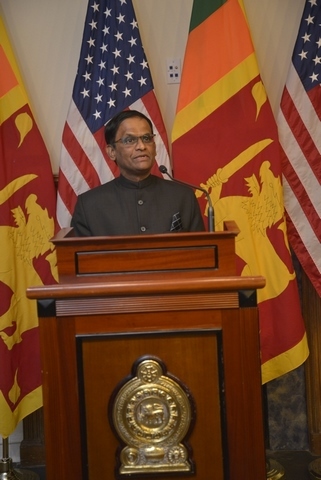 Commenting on the US – Indo Pacific strategy, the Chargé noted that Sri Lanka’s strategic location and its potential to become a finance, maritime, shipping, trade and transport hub seems to resonate well and be complementary for promoting rule of law, peace and security, open trade and maritime cooperation for the common benefit. Ongoing bilateral initiatives, such as the US – Sri Lanka Partnership Dialogue, defence and security cooperation, assistance received under USAID, Foreign Military Financing (FMF), US Peace Corps, House Democracy Partnership programmes, in disaster mitigation and relief, in mine clearance were acknowledged with gratitude by the Chargé. He observed that the recent transfer to Sri Lanka of the US Coast Guard Cutter, FMF grant of USD 39.5 mil and MCC compact programme which is in the pipeline, would provide tangible benefits to Sri Lanka. In regard to Sri Lanka’s exports, he observed that the US has become the largest market accounting for nearly 25 % of Sri Lanka’s exports. 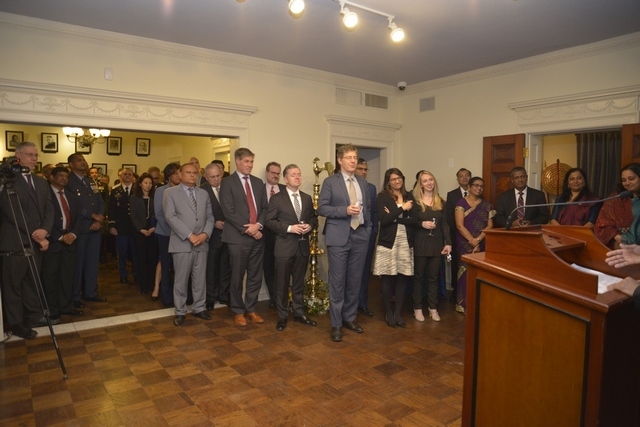 Welcoming US visitors to Sri Lanka to enjoy its warmth, diversity and hospitality, Chargé d ‘Affaires Dissanayake highlighted key attractions in Sri Lanka that listed it as Lonely Planet’s top tourist destination for 2019. Speaking on the occasion, the Chief Guest, Ambassador Alice Wells, Principal Deputy Assistant Secretary of State for South and Central Asian Affairs, hailed Sri Lanka’s vibrant and all inclusive democracy and country’s independent institutions and their resilience. 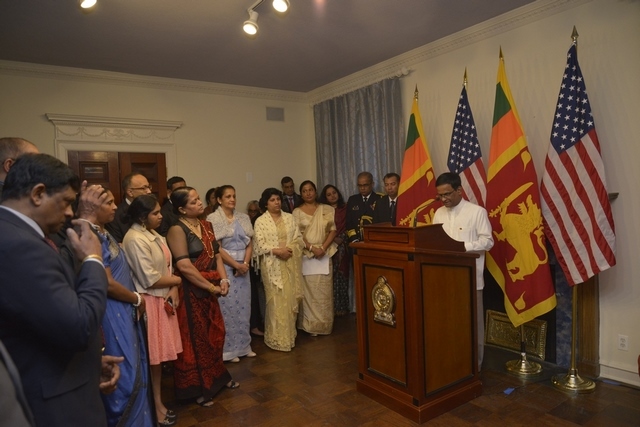 She noted that “As fellow democracies with diverse populations and an abiding respect for the rule of law, America and Sri Lanka have enjoyed close relations. Our valuable partnership is growing closer than ever. “We appreciate diversity as a source of strength; it is an asset to be embraced. These shared values are not merely theoretical, but are reflected in the close people – to – people ties between our countries”, she said. 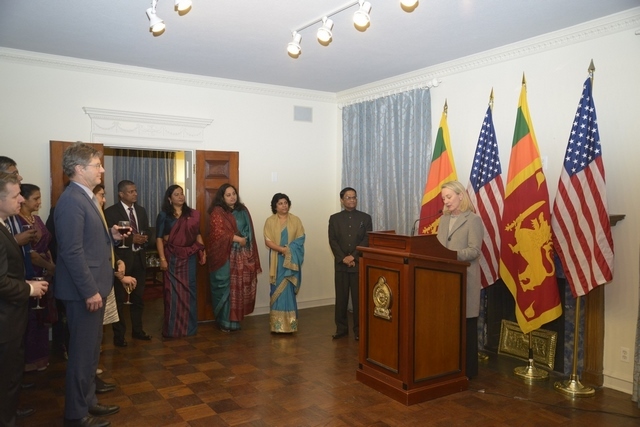 Speaking on Sri Lanka – US relations, she said “we hope to deepen our collaboration and partnership with Sri Lanka. There is a great scope in our relationship to build on cooperation on fostering entrepreneurship, encouraging investment, and strengthening rule of law”. In closing, on behalf of the United States, she extended her warm wishes and congratulations to Sri Lankans on their 71st Anniversary of Independence. 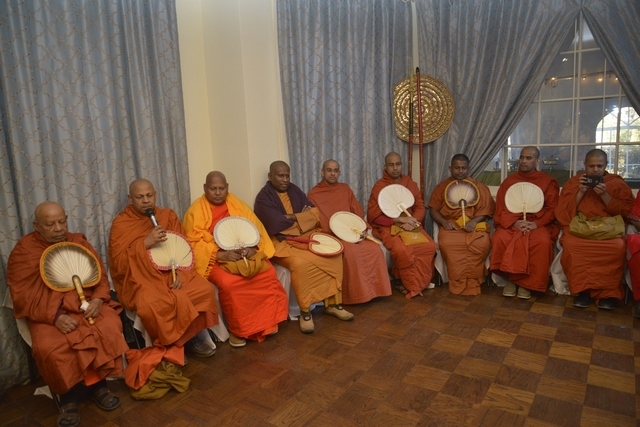 The Official Ceremony was held at the Chancery in the morning of 04th with the participation of the Sri Lankan – American community in Washington DC and suburbs. The ceremony began with the hoisting of the national flag which followed the lighting of the oil lamp. Thereafter the singing of the national anthem, observance of two – minutes silence for fallen heroes and conduct of multi -religious observance took place. The Independence Day messages of the President, Prime Minister and Foreign Minister were read out. Speaking on the occasion, Chargé d’ Affaires, Sarath Dissanayake echoed the sentiments expressed by Sri Lankan leaders on the importance of unity among all sections of society for the task of nation building and to usher a new era of peace, progress and prosperity for all Sri Lankans. 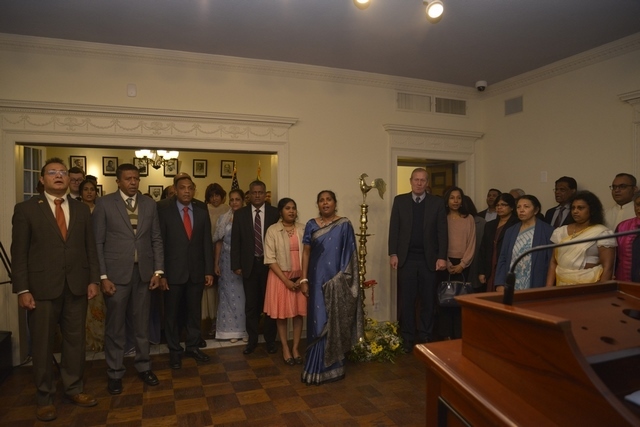 The Chargé d ‘Affaires greeted members of the Sri Lankan community and appreciated their contribution for the betterment of Sri Lanka and for the well being of its people. At the end of the event, guests were treated to kiri bath and traditional sweetmeat.